It’s been a hectic week littered with sick babies and tragedies for some of our closest friends. 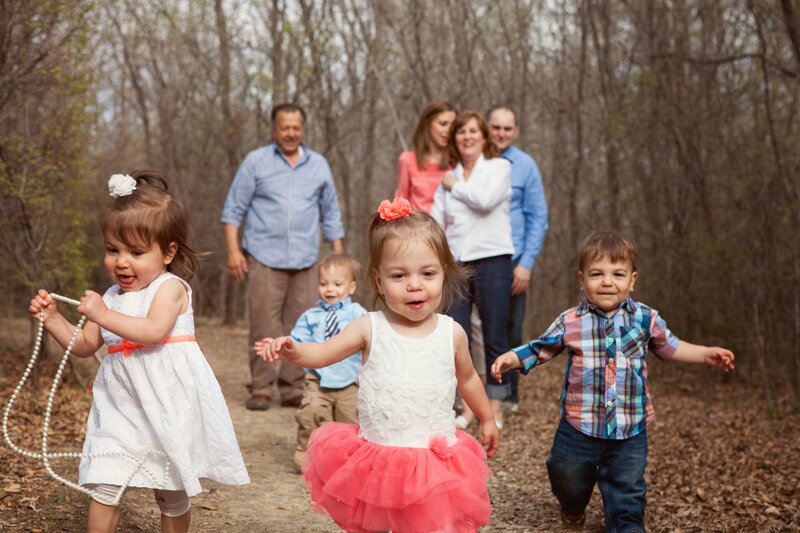 Our stress levels heightened this week, making it easy to forget the precious moments that brought joy. I thought it would be a good week to link up with Rebecca at a Beautiful Ruckus for The Little Things Thursdays. Even with added stress, we had plenty to celebrate. 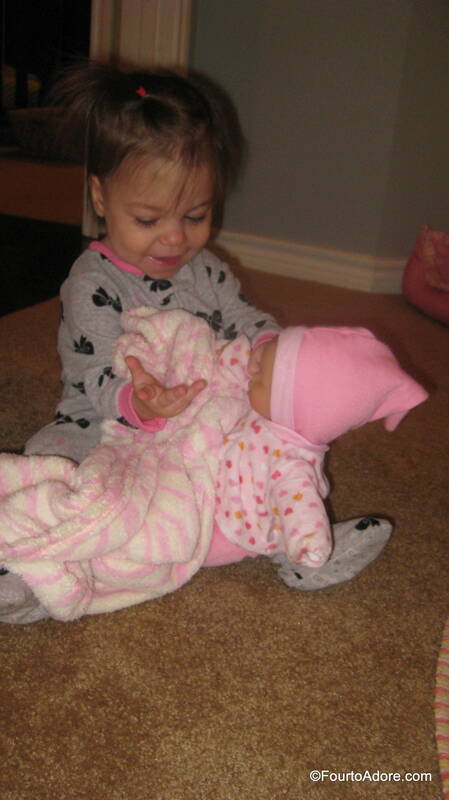 The babies may fight nearly constantly, but they have a strong sibling bond and adore each other too. They often dole out hugs and kisses to each other. 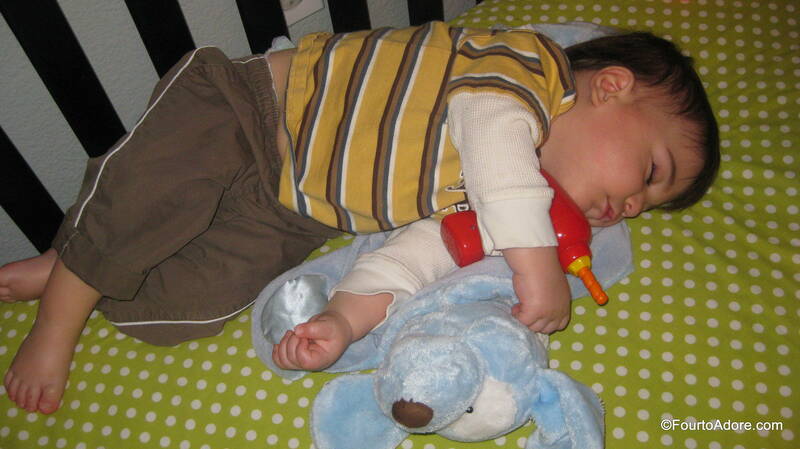 It always makes me chuckle to see how the babies fall asleep and what they choose to snuggle with, I mean a drill??? 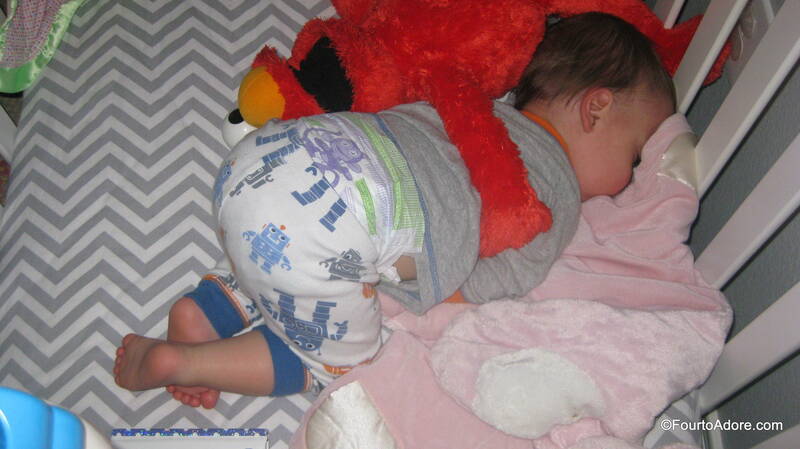 Apparently Elmo wanted to snuggle Mason. 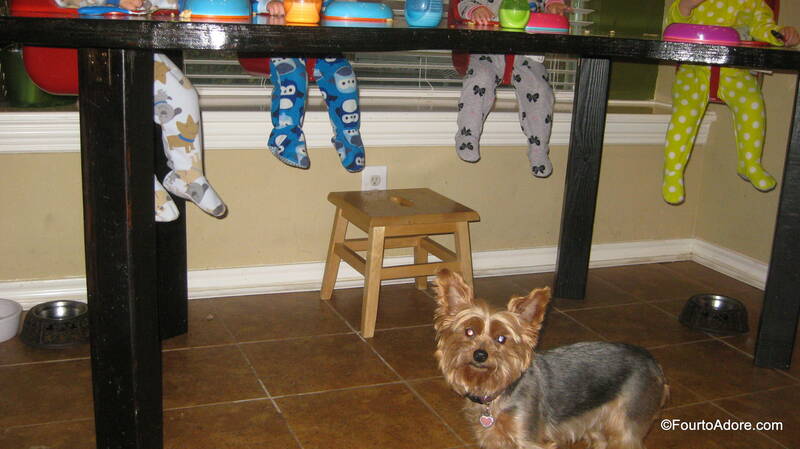 Early on in my pregnancy, we bought four antique children’s chairs. They’ve been taking up space in our bonus room nearly two years. 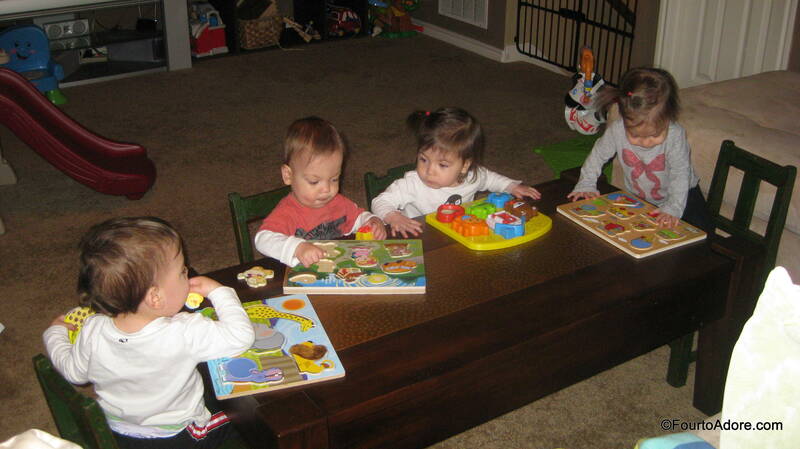 Recently, the babies proved they were big enough to use them, and they are great for table top activities. The only problem, Sydney figure out how to move the chairs to climb onto other things such as the sofa. Sydney is finally starting to engage in pretend play. She and Rylin have been feeding and rocking their “twin” babies all week. It’s not easy, but I love it when all four babies pile up in my lap for stories. I’ll keep cramming them in as long as possible. What little things brought you joy this week? HAHA Love that video!!!! That’s hilarious. And the pic of the sibling kiss is too cute. You’re a wonderful mom, Amber, and I’m so glad to know you! Thank you, hearing that from you means a lot. You are one of the few who understands my plight all too well. Mine months was one of my favorite ages! Baby giggles are the BEST! They melt my heart. Stay tuned for tips on reading to toddlers 🙂 I have a bag of tricks for you! 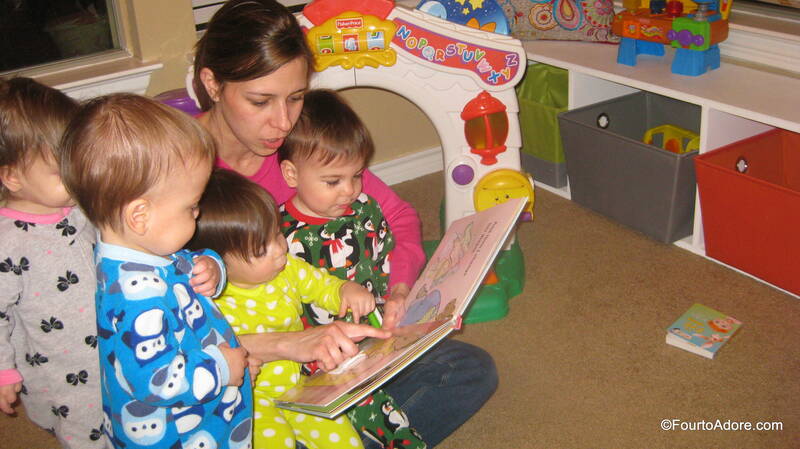 Check out the one where I’m reading to all four :). Everyone but Harper is wearing the same pajamas. That is a hilarious video. I believe she is smart enough to do something like that but to see it amazing. She’s something else isn’t she? Thank you for following! I love that picture too, my in laws snapped it. Amber you are just an amazing mom! The quads are growing so fast and yes the video was very cute. I miss and love ya’ll bunches & bunches cant wait to see more hopefully in person. You’re welcome to visit anytime!